The Pack are thinking about a big second half, and their bye week got them a little bit more healthy as they begin that second half run that they hope will end in a division title. This week they travel to the Motor City to take on the Lions, who last week had a shot to keep their modest win streak going, but instead laid a huge egg in Minnesota in a loss. Detroit thinks it’s still in the playoff race, as they have five of its final seven games coming at home, but the list of opponents is less than comfortable: Green Bay twice along with Houston, Indianapolis, Arizona, Atlanta, and Chicago. The only team among that group which doesn’t have a winning record is the Cardinals. The Lions’ defense is ranked 10th in the league at 329.7 yards per game but was awful when it last faced the Packers. Detroit allowed 550 yards in a 45-41 loss to close the 2011 regular season even though Rodgers didn’t play. Last Sunday’s performance might not give the Lions much confidence. They allowed 171 rushing yards to Adrian Peterson, let Christian Ponder complete 24 of 32 passes and watched Minnesota post its highest point total of the season. Schwartz defended the unit, highlighting the play of tackles Nick Fairley and Ndamukong Suh. Green Bay could take advantage of a vulnerable run defense after a surprisingly strong showing against Arizona. The Packers ran for 176 yards, their most since netting 202 against Cleveland on Oct. 25, 2009. They had four players – Aaron Rodgers, Randall Cobb, James Starks and Alex Green – record at least 25 rushing yards for the first time since 2003. The Lions lead the league with 307.3 passing yards per game, and Calvin Johnson is coming off his finest performance of the season with 12 catches for 207 yards and a touchdown. But they want to buck a trend of slow starts that has forced them to play from behind and rely so much on that passing attack. The Pack will let Rogers run the show, and their offense should be able to score enough points to get the win here. The Lions have to find a way to shut down Green Bay’s offense, and at the same time they can’t give the Pack short fields. If Matthew Stafford can have a mistake free game, and get the ball downfield to Johnson, the Lions have a shot. Green Bay though is just too strong, and they will get out of Ford Field with another huge win to send the Lions to 4-6, putting the Pack at 7-3 on the year. 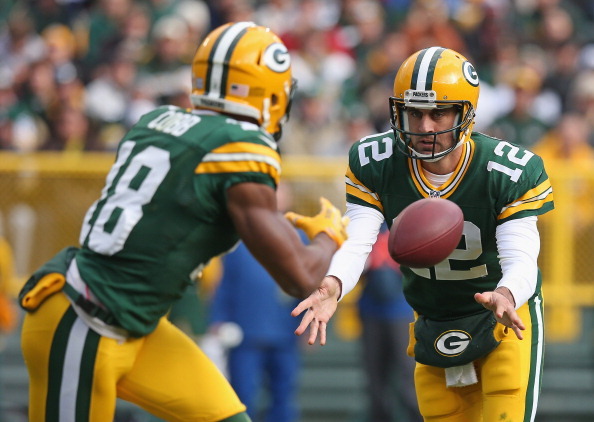 Packers or Lions – Who Wins This Week 11 Showdown? Subscribe to NFL Gridiron Gab via RSS Feed or E-mail and receive daily news updates from us!